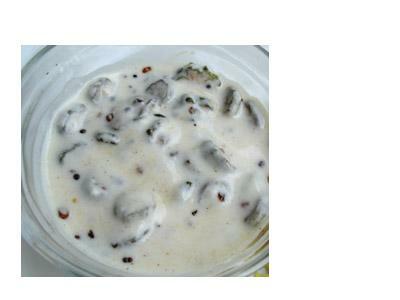 Bhindi raita or okra raita is a South Indian style raitha where it is also called 'Vendaikai Thayir Pachadi'. Small sized bhindi is good for this raita. 1. Heat 4 tbsp oil in a pan and fry the okra. Keep aside. 2. Heat 1 tsp oil in a pan and add mustard seeds and dry red chilli. When they splutter, remove. 3. Add fried bhindi, salt and above tempering of mustard seeds and red chilli to the well beaten yogurt. Serve okra raita chilled.